1.Preheat oven to 350°. In medium saucepot, cook cream cheese over medium heat 3 to 4 minutes or until smooth, stirring constantly with whisk. Remove from heat; stir in blue cheese, celery, chicken, sour cream, cayenne pepper sauce and lemon juice. 2.Transfer mixture to 9 x 9-inch baking dish; bake 25 minutes or until edges are bubbly. 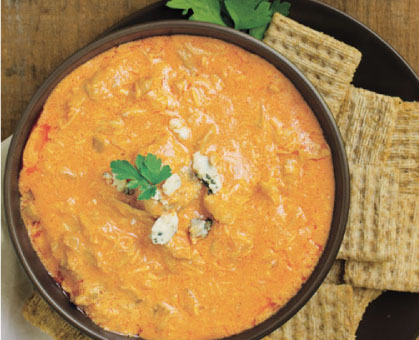 Serve warm with assorted crackers, toasted baguette slices, tortilla chips and/or vegetables.